Chancellor's Blog: Cheese fries and conversation! You might wonder what french fries drizzled with cheese have to do with a meaningful conversation. Surprisingly - a great deal. 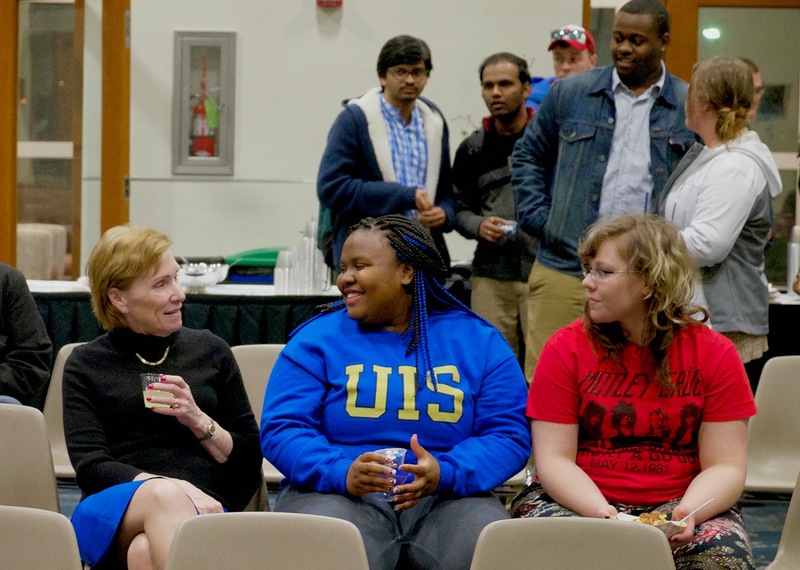 Each semester, the UIS Student Government Association and I partner to host a late-night forum for students – an opportunity for students to engage in conversation with the Chancellor on any topics they choose. Last night was the eighth such event in this series of “ch” inspired food themes. We’ve had Chocolate with the Chancellor, Chili with the Chancellor, Cheesecake with the Chancellor, Chicken with the Chancellor to name a few. Last night it was Cheese Fries with the Chancellor. We had a great turn-out and I’m always delighted with student participation in this event. The topics vary each time, but we all have at least one conviction in common: we want to make UIS a better place to learn, explore, and grow. I applaud UIS students for taking time out of their busy schedules and sharing their thoughts and hopes for our campus community. …and by the way the cheese fries (along with some UIS M & M’s) weren’t bad either!